Large chamfer in nut eases starting of bolt. Special shaped inturned edges and tapered, serrated grooves produce strong vice-like grip between channel and nut. Channel edges and nut's tapered grooves act as guides to provide positive alignment of connection. Nut teeth grip the channel's inturned edges, tying the channel sides together in a "box" configuration for added strength. Longitudinal movement of nut is resisted as hardened teeth bite into the inturned edges. Spring allows precision placement anywhere along channel length, then holds nut in position while connection is completed - the workman's "third hand". Spring nut is inserted anywhere along continuous slot. Rounded nut ends permit easy insertion. A 90° turn positions the serrated grooves in the nut with the inturned edges of the channel. Fittings may be placed anywhere along channel slot permitting complete freedom of adjustment. The need for drilling holes is eliminated. 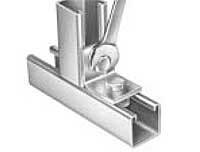 The fitting makes the connection between any framing channels or as means for other attachments. A turn of a spanner locks the serrated teeth of the nut into the inturned edges of the channel to make the strong, vice-like connection.